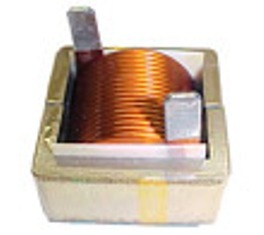 Capable of handling very high DC bias current with lowest inductance roll off. Helical Wound Bobbinless Surface Mount. Custom designs for other inductances and current rating available. Please contact us. Dimension: Please see individual engineering drawings. 2) Samples available for large volume OEMs. Pricing for large quantities may be significantly lower. Please call? or e-mail us to inquire further information. 4) Custom designs are available to meer any of your requirements. 5) Rated Current is based on a 40 deg C temperature rise at an ambient temperature of 125 deg C.
The High Flux and MPP cores are rated over 200 ged C. The helical frat wire's insulation is rated at 200 deg C.
You can sort the data shown below by clicking preferred header.